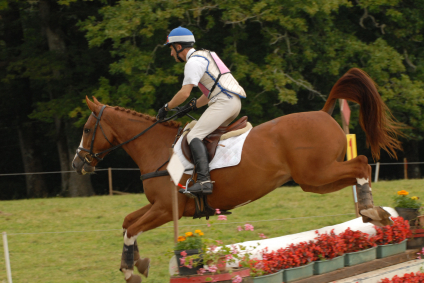 Jump racing, also known as Steeplechases are gaining popularity in the US. Known as National Hunt racing in the UK and Ireland, this particular style of racing has a long history and great popularity overseas. Spectators flock to these races and bettors all around the world wager both at the track and online. This grand traditional sport is not free of it’s share of controversy, however. Steeplechase races got their start in the late 1700s in Ireland and were originally a wager between two men. The race was 4 miles, cross country from one church steeple to another, hence the name “Steeplechasing”. Early steeplechases were all held as cross-country races. It was not until 1810 that the first recorded steeplechase on a prepared track was held. These races were made to be as similar to the English countryside as possible. It was not until 1830 that the first officially organized National Hunt Race was competed. National Hunt races are so popular in England that they amount for about 50% of all jump races worldwide. France, Australia, the Czech Republic and the United States are some of the biggest countries in steeplechase racing. While jump racing and steeplechase racing may be interchangeable terms, but when it comes to types of races it’s helpful to be specific. Chase races – These are typically between 2- 4 ? miles. The obstacles in this race are called fences, and are a minimum of 4 ? feet high. Hurdle races – These races are a little shorter, they range between 2 – 3 ? miles. The obstacles in this race are called hurdles and are a minimum of 3 ? feet high. National Hunt Flat races – These races are amateur races, usually used to train horses before entering them into more strenuous jump competitions. These races are also referred to as “bumper” races as these races originally allowed amateurs to run. Their ungainly racing and tendency to bump into each other earned these flat races their nickname. Like any equine sport, there is a great deal of controversy surrounding it. Australia has banned jumps racing in all but two states, claiming animal cruelty. While animal cruelty is nothing to scoff at, the worst part of equine injuries is how often they are fatal. Even simply walking can cause injury that can completely ruin a horses’ racing career. In 2008 Casino Drive got a stone bruise to his foot while simply walking on the horse paths at Belmont Park. Jumps racing does have a very high mortality rate. Because horses rely on their legs, any injury that would be relatively minor to a human such as a sprain or a fracture can be devastating to a horse. In jumping, sometimes up to three times the horse’s body weight is on the front legs. This can be around 3,000 pounds! This weight on bones that are still developing is very hard. 2-3 year old horses still do not have matured skeletons. To keep them off of an injured leg, a horse must be put in a sling to hold its weight up. This is extremely stressful physically and mentally to the horse. Horses cannot lay down for too long a period of time, and even the sling can damage a the horses’ internal organs. These injuries can be prevented, with a healthy diet and an appropriate amount of rest between races. AAEP, the American Association of Equine Practitioners recommends at least a 10 day rest period between races.